Forty years after the fall of Saigon, a U.S. Foreign Service veteran remembers the disillusionment, desperation and chaos of South Vietnam’s final days. 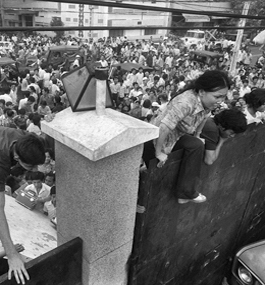 LAST CHANCE: On April 29, 1975, South Vietnamese citizens climb the 14-foot wall around the U.S. embassy in Saigon to try to reach evacuation helicopters. South Vietnam seemed strangely secure when I arrived in Saigon as a first-tour State Department political officer in late 1974. But signs soon suggested that stability was chimerical. In early January 1975, I pulled late duty to send Washington the English translation of the speech President Nguyen Van Thieu gave to his nation after the North Vietnamese Army (NVA) overran Phuoc Binh, just 90 miles north of Saigon. Thieu had rationalized that retaking the jungle town was not worth the cost. Militarily, he was right, but politically this was a disaster. Phuoc Binh was the first provincial capital the government had permanently abandoned after more than a decade of war. Even more dismaying, Thieu rambled on for three disjointed hours. Vietnam’s president and commander in chief seemed to be losing it. While the translators worked, I slipped over to the Recreation Association to grab a sandwich. It was Luau Night around the swimming pool. U.S. contractors decked out in orchid leis were being served by waitresses in sarongs, all lit by tiki torches. The incongruity stunned me: partying as usual while the NVA racked up the score, less than 100 miles to the north. This cannot last, I thought. But I wanted to see the situation for myself. So in early 1975, I took annual leave for a four-day bus trip over the Tet (Lunar New Year) holiday, unarmed and unescorted, deep into the Mekong Delta. No travel clearance was required in those days. It was a different time and a different Foreign Service, hard to envision in the current era of cocoon-like constriction. Our former team interpreter, a lasting friend whom I got out a few months later, went with me. We encountered no problems on the road. Vietnamese, though astonished to see an American on the bus, were happy to banter for long hours. Once we arrived in the district, the army captain now in command of it was a different matter. Totally flummoxed, he wanted us out of there. It soon became clear why. His outposts looked like the Maginot Line, because the Viet Cong roamed unchallenged right up to their gates and government militia to man the walls were scarce. Caught on the road at sunset once, we overnighted with a village notable we knew well. We could sleep in his house, but the Viet Cong were “all around,” he warned. The old gentleman kindly left us a concussion grenade before quickly departing to sleep elsewhere. We high-tailed it back down the road at the break of dawn. I got what I wanted: a reality test of security on the ground, 1975 versus 1971. The official security rankings for the district — “average for the country” — had not changed in four years. But the place we once knew to be 80 percent secure was now reduced to a hollow eggshell, waiting to be cracked. Back at the embassy, my trip provoked no criticism. But neither was there a shred of interest in drawing on it for “defeatist” reporting to Washington. From mid-January to mid-April, the NVA rolled up the country rapidly. The Army of the Republic of Vietnam collapsed due to panicked orders from Saigon and incompetent senior leadership, with a few notable exceptions. The 18th Division bought 10 days with its heroic stand at Xuan Loc, northeast of Saigon, before it was overrun. Although the imminent fall of South Vietnam was obvious to all of us, U.S. Ambassador Graham Martin adamantly clung to the hope that some political compromise could be worked out. Martin had lost a foster son, a helicopter pilot, in the war. He could not admit that defeat was a foregone conclusion. The political section began discreetly identifying particularly high-risk Vietnamese for possible evacuation. In the end, however, the criteria were too vague, and the list was too long to be prioritized. For any given Vietnamese, it all came down to whom he knew, how lucky he was and how far his American contact would go to rescue him. 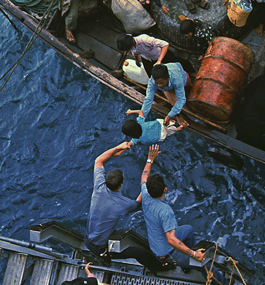 LIVES IN THE BALANCE: U.S. officials reach for a South Vietnamese child being transferred to a U.S. Navy ship. Sure enough, within the hour I ran into Rosenblatt and Johnstone climbing the back staircase to see me. I hurried them out of the embassy before they were spotted and, later, fixed them up with contacts at the Tan Son Nhut evacuation site. Over the next week, to their great credit, they got 30 contacts and their families out before departing themselves on the last commercial flight from Saigon. A week before the end, the Department of Justice finally author­ized “parole status” for the Vietnamese families of the estimated 5,000 private American citizens who refused to leave the country without them. An aide to the ambassador set up a center at the airfield to process these roughly 20,000 people. I soon joined him. We were stamping out “parolees” on the afternoon of April 28 when turncoat government pilots bombed and cratered the airfield. The damage put an end to any further fixed-wing evacuation. We were now down to limited helicopter evacuation from the airfield and the embassy, plus a barge route down the Saigon River. The barges were the brainchild of two USAID field officers, who had distinguished themselves in chaotic evacuations down the coast from Da Nang and Nha Trang. At the end, the two personally nursed Alaska Contracting barges down the river to the sea. But due to the lack of embassy planning and execution, the enormous barges went out only half-filled. The song “White Christmas,” the mission-warden code for activating the evacuation, started playing on the radio. It was time to rise and shine — and make things happen. Several weeks earlier, I had signed on to drive high-risk contacts down to the Saigon docks for evacuation by sea. Around noon on the 29th, I grabbed a nine-passenger van with a full fuel tank and headed out to the safe house where political-section contacts were supposed to assemble. I requested that Lacy Wright, the deputy in the section, lead the way for the first run because he spoke excellent Vietnamese. The ticklish part would be negotiating our way through the police guards protecting the docks to get to the evacuation barges on the river. I didn’t want any linguistic slip-ups to block our entry. The safe house was already swarming with people when we got there, and it only got worse throughout the day. Word on the street spread fast; it had been an illusion to think we could keep the safe houses secret. Separating out the genuine high-risk cases took time. We crammed up to 20 people into each van without making a dent in the inflow. Lacy sweet-talked us through the police and army barricades for the first run, then he and I got separated. One foreign-service officer, stuck at the closed-off airport, linked up with the Marines to courageously thwart enraged paratroopers trying to force their way aboard the airlift or block the evacuation. My boss got stuck with a houseful of high-level VIPs, but, despite frantic calls, no vehicles were ever sent to pick them up. In the end, he made it back to the embassy by foot but could get only three high-level friends through the gate with him. A third officer, driving a rescue mission, got stuck cruising around Saigon with two full bus loads and nowhere to take them. The airfield and the embassy were buttoned up tight. Tellingly, nobody in charge directed his buses to the barges leaving half-empty from the river docks. Sadly, snafus and disconnects like these were the rule of the day, not the exception. Those with initiative — who would rather ask for forgiveness than wait for permission — were the ones who were truly effective. Officers from the Defense Attaché Office at the airfield had control of key assets, personnel to deploy and the nerve to jump the start gun. The rest of us played it by ear the best we could. Back at my safe house, from all I could tell I was completely on my own. As the city shifted toward chaos, I could raise only the front office on my radio. I got plenty of “attaboys” and “stick to it as long as you can,” but no useful guidance or info of any kind. Fortunately, the mood on the streets had not yet turned against us. Renegade South Vietnamese soldiers turning their guns on us — not the NVA — were always our biggest security risk. We knew leaders of the Airborne Brigade were actively plotting to take Americans hostage to ensure their own evacuation. Beware the wrath of a betrayed ally. I repeatedly delivered my passengers, and policemen guarding the docks grudgingly accepted handfuls of Vietnamese cash. Toward the end of the day, a young army officer at a roadblock detained my van. Trouble, I thought. “No, I just want to say thank you for trying,” he said with a salute. The lieutenant declined to climb in with me, saying he would stay with his family. Earlier, a senior embassy translator had declined a similar offer, snapping, “No, I’m Vietnamese. I’m staying.” It sounded like he’d already paid his dues to the new order and knew he was safe. IMPLORING, NOT ANGRY: South Vietnamese civilians wait outside the U.S. embassy gate on April 29. By the time the long shadows of late afternoon arrived, there had been a long gap in the evacuation helicopters coming from the Seventh Fleet. Crowds overran my safe house. Two longhaired Saigon cowboys in bell-bottoms carried in a desiccated grandfather on an ebony chair — outrageous draft dodgers, not the people we set out to save. On top of it all, my van’s once-full fuel tank was now running on fumes, and gasoline stations were shut down tight. It was time to head back to the embassy. I radioed that I was coming home. The ambassador’s longtime special assistant for field operations asked, as a personal favor, if I would make one more run to pick up his household staff. He told me I could siphon gas out of his parked car. So, gasoline taste in my mouth, I made one more run for the docks. Back at the embassy, I found packed crowds hunkered down, waiting. Earlier wall climbers had been beaten down. Street toughs had cannibalized abandoned cars down to their naked X-frames, motor blocks and all. The vandals were snarly and scornful. But as I inched through them, the tens of thousands waiting around the embassy were imploring rather than angry. The Marine guard at the main vehicle gate could not let me in. Once he cracked the gate, masses of people would break through. He had orders to fire on them if they did. Baffled, I tried to figure out what to do. I threw my Samsonite briefcase over the wall, not wanting to get caught with the two hand grenades inside it if the crowd turned mean. Finally, another Marine directed me to the small sally-port gate opening into the consulate. It was buttressed by projecting towers so that only one person at a time could pass. He asked me to collect the various Americans locked outside and quietly slip them over to the opening. Slowly, mustering every courtesy term I could recall from language training, I worked my way around to the other side of the compound. “Don’t worry — we’ll have helicopters enough for everybody who wants to go. We are not leaving without you,” I assured one and all. To my relief, they seemed to believe me. Because they wanted to, because they had to. What other hope could they have? I collected about 10 Americans and their families, and gingerly got them to the consulate gate. Two huge Marines in full battle rattle came over the gate. I positioned myself between them as we passed each person through, including a very pregnant woman. Three stout men on the backside of the gate opened it and closed it behind each entrant. My job was to pick out those who were to be saved and keep uttering the implausible promise that we would not abandon anybody. The two giant Marines repeatedly muscled the crowd back with their flak-jacketed bulk while snapping the loading slide on their (unloaded) M-16s for dramatic effect. I marveled at their cool — they didn’t understand the language and were totally vulnerable to a hidden knife or pistol. Later, I wrote them up, and they both got military awards and a coveted assignment to guard duty at the U.S. mission at the United Nations. Inside the compound, I stripped to the waist, wringing buckets of sweat out of my shirt. I threw away a filthy gray-striped seersucker jacket that had covered the revolver tucked in the small of my back. Suddenly, a platoon of some 40 Marines charged out from the main door of the chancery building, crossed the front lawn and flung their backs against the compound wall. Soon DCM Lehmann appeared, gesturing firmly, and called them back. The Marines moved away from the wall and back into the chancery building. It turned out the CIA station had assembled a bunch of “assets” in a building across from the embassy and then arranged for the Marine detachment to mount an assault over the wall and push the crowd back to open a corridor for those chosen few to get to the gates. Given the thousands of people in the street, it’s hard to imagine how this scheme could have worked out, unless the Marines had provoked panic by also firing into the air. But once the front office got word of it, the DCM promptly stomped on it. THE LUCKY ONES: Under the watchful eye of U.S. Marines, a line of nonmilitary evacuees, luggage in hand, board an aircraft at Tan Son Nhut Air Base, near Saigon. The DCM’s intervention, however, was the only case I know of where the front office exercised effective control over any part of the street-level evacuation. On the contrary, the mission leadership was overwhelmed with dealing with Washington and, by all accounts, out of contact with what was going on outside. If the Vietnamese trying to escape didn’t have an American protector to provide access to evacuation points — embassy, airport or barge dock — they were left behind. Most were left behind, including one agency’s full complement of 200 staffers and their families. Their American supervisors clearly were isolated and out of the loop until the balloon went up. When it did, they were ignored — misled, allegedly — and ultimately helpless to save their people. They had gullibly accepted generic assurances that their people would be wrapped up in the overall mission evacuation. No other agency, to my knowledge, was similarly naive. I entered the chancery as tropical darkness fell suddenly. The political section was totally empty. Nobody could be found on any working-level floor that I could access. All the offices were thoroughly trashed, with the IBM Selectric typewriters getting special attention. An odor of alcohol wafted through from time to time. Only when I got to the outer office of the executive suite on the third floor did I find a gaggle of people. Though I saw nobody drinking, painkiller had clearly been applied here and there. I received plenty of congratulations and pats on the back. There was nothing more to do but wait. Eventually, a CH-53 Sea Stallion arrived on the landing pad atop the building. A few Americans were needed to fill out an otherwise overwhelmingly Vietnamese passenger list. At the foot of the stairs to the roof, immediately in front of me, stood an impeccably dressed Europeanist doing his obligatory excursion tour to Asia, complete with perfectly pressed suit, neatly combed hair, starched handkerchief adorning his jacket pocket, polished attache case and overnight bag. Right then and there, I decided I would never become like him. As we started up the stairs, Ambassador Martin came out of his private office to pull me aside. Putting his hand on my shoulder, he intoned in a low Southern patrician voice that he knew what I had been doing out on the streets and he wanted to thank me. Truthfully, I felt honored to be there at the end, to have done all that I could do. For all his foibles, the ambassador had extended a gracious gesture that I had no right to expect. It was pitch dark as the chopper lifted off the roof, but we could see scattered fires burning in the distance. By the glow of the eerie blue interior light, I could make out the Vietnamese passengers around me. Some Americans were aboard for sure, but not many. Contrary to some accounts, I detected no enemy groundfire reaching up to us. The NVA wanted us gone in time to celebrate their victory on May Day, and we were going. They may have painted our choppers with their targeting systems, but they let us go unimpeded. After a while, we landed under floodlights on the USS Hancock, a World War II-era carrier. Those of us with pistols handed them over. I slept for much of the five days’ journey to Subic Bay, in the Philippines. The evacuation concluded in the early morning of April 30. Ambassador Martin admirably made the evacuation as long as possible to get out every Vietnamese he could — “just a few more helicopters.” Several inbound crews crashed from vertigo. Exasperated Navy officials finally got a direct presidential order to make the ambassador get on a designated helicopter just before dawn. That’s what it took. Once the ambassador departed for the fleet, Americans-only boarding was strictly enforced. In the process, some 400 Vietnamese — including all mission firefighters who had volunteered to stay to the end — were abandoned. Stuart Herrington, a Vietnamese-speaking captain in the Defense Attaché Office, had kept the crowd under control by promising he would not leave until they left. He was utterly devastated to be ordered — forced — to abandon those to whom he had given his personal word. After joining USAID in 1969, Joseph McBride spent 37 years in the U.S. Foreign Service. In addition to Saigon, he held assignments in Rome, Bangkok, Lima, Managua, Bogota, Kandahar and Washington, D.C. His post-retirement activities have included backstopping drug eradication in Afghanistan and peacekeeping in Darfur. 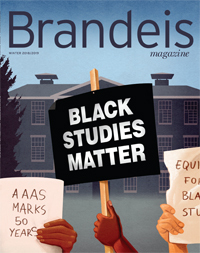 A longer version of this article appeared in the April 2015 issue of The Foreign Service Journal.